Villa San Marco condominiums in St. Augustine, Florida. Welcome to a place where beautiful weather, blue skies and the gentle sway of tropical palms in warm coastal breezes are daily reminders that paradise is real. Welcome to a relaxing new way of life where intimate accessibility to five-star dining, boutique shopping, and sophisticated arts and entertainment venues allow you to make the most of every day. 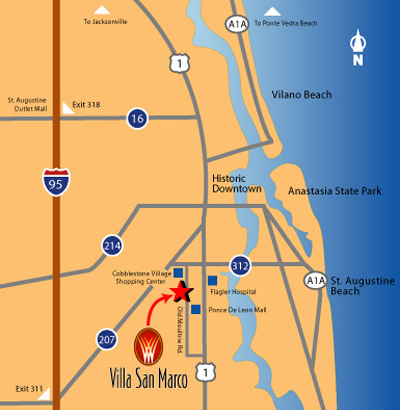 Villa San Marco is a luxury condominium with 178 units by McRae & Stolz in St. Augustine, Florida offering distinctive one, two and three bedroom Mediterranean-style homes in a private, gated setting with a wealth of resort-style amenities. See master plan. This condo conversion is conveniently located off U.S. 1, just minutes from the charm and ambiance of the cobblestone streets of historic downtown St. Augustine, renowned for garden courtyards, decorative tile fountains and an eclectic diversity of art galleries, restaurants, boutiques and landmarks including the Bridge of Lions, the Castillo de San Marcos and Fort Matanzas. A short drive west over the Intracoastal Waterway leads to legendary Florida A1A and 43 miles of pristine oceanfront comprised of St. Augustine Beach, Anastasia Island and Vilano Beach. Villa San Marco is close for a prefect day of swimming, fishing, sailing, biking, beachcombing or simply enjoying the warmth of the Florida sun. Take U.S. 1 north to Jacksonville or catch Interstate 95, a short distance down County Road 207. See area map. Villa San Marco offers residents a wealth of amenities including clubhouse featuring a kitchen, library, lounge area, a multipurpose room and a fireplace, pool, heated spa, state-of-the-art fitness center, outdoor gas grill, limited access gated privacy, putting green, playground, bocce ball court, nature preserve and boardwalk, car care center and a business center with fax machine, copier and computer station. Villa San Marco offers three distinctive floorplans range in size from 760 square feet to more than 1,200 square feet in eight, two-story Mediterranean-style buildings. Each home features a fully equipped designer kitchen with Whirlpool appliances, self-cleaning oven, microwave, dishwasher, disposal, double sink and refrigerator with icemaker. Each home has arched windows and entryways, 9-foot ceilings with crown molding, ceramic tile in the foyer, kitchen and bathroom, and ceiling fans in the living room. Spacious walk-in closets, laundry enclaves with washers and dryers, vanity bathroom lighting and fully enclosed patio balconies also are included. There are optional garages, with electronic door openers and storage, and intrusion alarm systems. High-speed Internet access also is available. Choose from the Valencia, Granada and Seville plan. Call and email me today for availability. I will represent you at no charge.